Katie McGarry is one of my auto-buy authors. I’ve read all of her novels, and I’m impressed by how real and different each one is. Katie’s Pushing the Limits series was incredible and her Thunder Road series is so promising. The Thunder Road series begins with Nowhere But Here. I liked Nowhere But Here, but I definitely did not enjoy it nearly as much as I did Katie’s other novels. Walk the Edge blew me away. I was immersed into Breanna and Razor’s story right away. Breanna is the fifth child of nine. She’s too young to be considered one of the “older siblings” and too old to be a part of the younger crowd. As the oldest in the house, Breanna is tasked with taking care of her four younger siblings while her parents work, even when it means putting aside her own needs. Not only that, but Breanna’s brain works differently from everyone else because she basically has a photographic memory. Because of all of this, Breanna doesn’t fit in with her family. Razor is a part of the Reign of Terror motorcycle club. He’s the only member still in high school but since he’s eighteen, he was allowed to be pledged in. Razor had the longest prospect period in the club because he’s unpredictable, which makes others nervous. A lot of this is due to Razor’s mother’s death. When he was ten, she was in an “accident,” which most people believe was actually suicide. Since then, Razor has closed himself off and has trust issues, especially when he finds out that the club may have been involved in his mother’s death. Breanna and Razor’s lives meet when Breanna is forgotten at school and Razor’s bike breaks down in the parking lot after the senior class’s orientation. Believing all the town’s gossip, Breanna is scared for her life and accidentally insults Razor. She tries to cover herself by hiring Razor as a “bodyguard,” which he takes seriously and ends up helping her out the next weekend. They have an intimate moment, which is captured and used as blackmail against Breanna so that she’ll write the star football player’s English papers for the year. Razor teams up with Breanna. She’ll try to break the code that involves Razor’s mother’s death and the club for Razor, and Razor still wants to protect her. When Razor finds out about the blackmail, he’s beyond angry, especially when he realizes that one of his best friends was also blackmailed by these same guys over the summer. I felt so much for both Razor and Breanna. I actually teared up during parts of the book because I was either so frustrated or heartbroken over their situations. I literally just wanted to step into the story and slap some sense into Breanna’s parents (and siblings for that matter). It’s totally not fair how they treated her. Also, watching Razor’s relationship with his father and his club brothers fall apart due to trust issues was hard too. I think one of the reasons I didn’t enjoy Nowhere But Here as much was due to an overload of motorcycle club stuff. The focus of that novel was on the club, and while Walk the Edge does deal with the club, I liked how it wasn’t focused on as much in this story. There was just the right amount of motorcycle club, which was perfect. The romance between Razor and Breanna was so, so swoon worthy. Honestly, I didn’t know how I felt going in after reading the synopsis. I was really curious about Razor after reading Nowhere But Here and excited to read his story, but I just didn’t know if I was going to like Breanna, the good girl, and Razor, the bad boy, falling for each other. Oh boy, was I wrong. I absolutely adored and loved their romance so much. And, Razor, oh my. Just all the heart eyes. 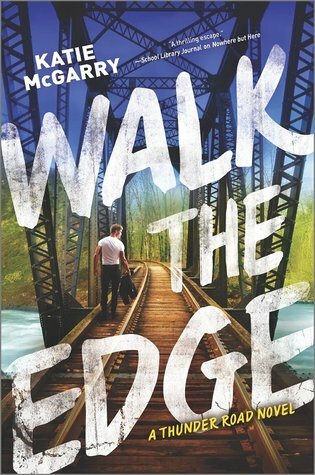 Overall, I loved Walk the Edge, which is now tied with Dare You To and Take Me On as my favorite Katie McGarry novels. I can’t wait for Violet and Chevy’s story, which is the next installment in the Thunder Road series. I highly recommend Walk the Edge and Katie’s other novels for fans of contemporary romance that are swoon worthy while still dealing with tough issues at the same time. Thank you for putting on an awesome tour! I’m so glad I was able to participate in it! Walk the Edge was SO good, wasn’t it? Like you, I really think that what WtE better than Nowhere but Here is that it focused less on the issues of the motorcycle club, and more on Breanna and Razor. And YES I get what you mean when you say that you were so heartbroken and frustrated when reading about their situations – I felt the same way, especially when they interacted with their respective families. Katie did such a marvelous job in writing this book! I know!! I was so impressed by this story, and I absolutely cannot wait for the next book in this series now!